SMS and Secure Messaging are having an incredible impact on both hospitals and home health care providers. Communicating via SMS and text messaging is now an embedded part of our culture. The ease with which text and pictures can be captured and sent make it a perfect method for communication between nurses, doctors, and other clinicians. It doesn’t matter if they are in the same building on the same floor, or if they are working in a multi-building campus setting, or even if one person is in the field at the home of a patient and the other is back at the office. Convenience is great. 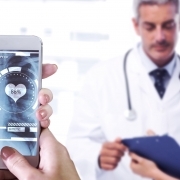 The same ease-of-use that people get from communication with SMS and Text messages has quickly migrated into the medical industry. However, the pitfall is that these channels are not secure, and not HIPAA compliant. This has given rise to Secure Messaging apps. Messages and photos sent between two devices, (or a device and a tablet or computer) are encrypted. They are also HIPAA compliant. The best of these apps maintain the feel of plain-old-texting yet don’t compromise patient information. The messages can also be integrated into a Patient Information System and attached to the patient’s record. Some secure messaging applications also enable users to communication via voice and video. These conversations are also encrypted so that they are HIPAA compliant. This is particularly important home health care industry. In a hospital or campus environment, a doctor or specialist may only be a few minutes away when a clinician determines the need real-time input on a patient’s care. With secure voice and video, an in-home clinician can get that same level of guidance at the remote location. Questions also arise when the patient sends a text or photo to a medical professional. While the message the patient sends is not subject to HIPAA, the reply may be. In this case, there has to be a mechanism for the clinician to receive the message over an open channel but respond over a secure channel.